Put your trust in a service in Surbiton with a client rating of over 96%! A: Unlike the original ladder & squeegee method, the water-fed pole allows the cleaners to reach panes from the comfort of the ground. The retractable rod is 22 metres high and can easily reach even stains on the fourth floor of your property. 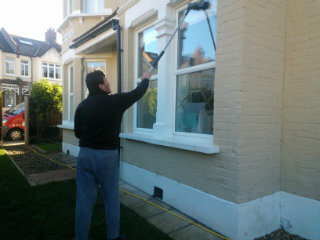 Q: What other cleaning possibilities are included in window cleaning Surbiton? A: Besides providing diligent exterior window cleaning, the approved technicians can also conquer and wash any commercial skyscraper – a service known as rope access window cleaning. Finally, the cleaning experts can also deal with grime found on the interior surface of your panes, and will bring ladders and sponges to access distant corners. A: Our water has been purified from all naturally found hard minerals. As a result, it will efficiently absorb all blemishes on its path and will vaporise under the sun without leaving residue marks of its own. A: Yes, the Surbiton window cleaners will appear with the latest cleaning gadgets to rinse business buildings both short and lofty. The pros can also carry out extra cleaning tasks, for example patio washing and gutter cleaning. A: Naturally. The team's water-fed rod is connected to a special distilled water container inside the washing vehicle. In case the liquid has been used up, the cleaners will kindly ask you to supply them with any inside or exterior water source. A: Yes, all our services are comprehensively insured for your ease of mind. However, our washing technique is among the soundest that you can find on the market and we'll make sure to wash your windows without leaving a single scratch! After going through lots of customer feedback, we've adjusted our window cleaning Surbiton's charges. Now, you can schedule our service at prices that are nothing short of competitive! For further details, please consult with our price table below. No matter where your streaks have taken shelter, our resourceful window cleaning in Surbiton will fight them off with ease. We have covered a number of cleaning methods. Our exterior window polish is suited for properties that do not exceed four floors. To let the sunlight back inside, the window cleaners in Surbiton will appear in a van, supplied with a retractable water-fed rod. This system is connected to a water storage, filled with filtrated water. After being pushed as a powerful flow from the pole's brush-head attachment, the liquid will dissolve all smears in an attempt to regain its natural structure. To reach muddy window corners of lofty properties, we'll send a seasoned team for rope access window washing. These licensed climbers will utilize frequently inspected ropes and harnesses or position ladders and cherry pickers to renew the appeal of your panes. We've got all important COSHH reports in place and follow every safety instruction. To make the interior surface of your glass façade just as lustrous, the pros will rely on the ordinary ladder and squeegee washing method. Over time, we've responded to the cleaning calls of customers from many neighbouring regions. As a direct result, we expanded window cleaning Surbiton's horizon and you can now witness our cleaning caravans in the districts below. Another quick and easy way to get a free instant quote or to book window cleaning services Surbiton KT5 is through our web site.